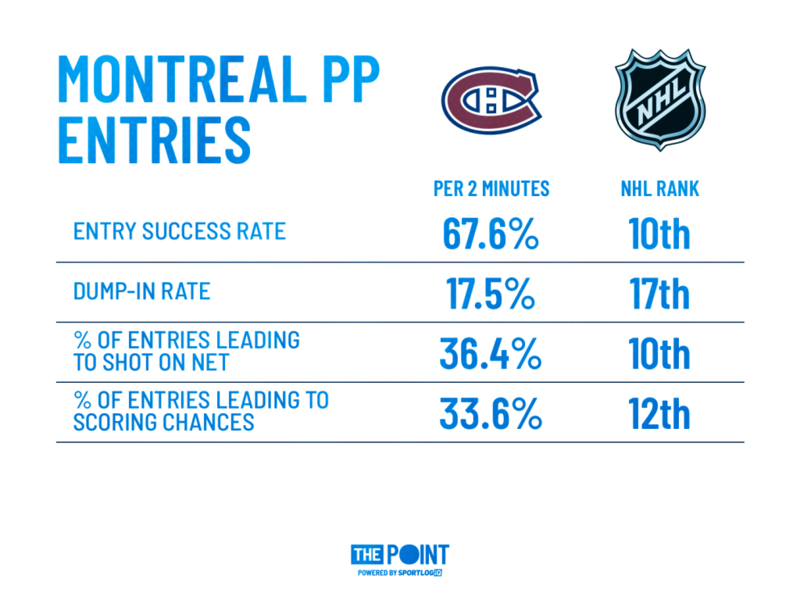 Breakdown: The Canadiens PP struggles - Overall and during current 0-25 stretch - The Point Data-driven hockey storytelling that gets right to the point. The Montreal Canadiens powerplay has been a display of futility this whole season. Their success rate is a meager 12%, only higher than the league-worst Blackhawks. To cap it all off, the Canadiens have now failed to score on their last 25 powerplay attempts, going scoreless since Tomas Tatar scored against the Rangers on December 1st. Today, I got my snorkel out and took a deep dive in the mess that is the Montreal man advantage. Here’s what stands out. After spending significant time and energy in puck battles along the boards, when the Canadiens do get the puck, they feel rushed to move the puck away from the scrum quickly. They want to make something happen and also make up for the time lost. Problem is, that leads to a lot of rushed and inaccurate passes. Spending so much time up against the boards fighting for the puck and then whipping it around inaccurately can’t be good for your shooting, right? 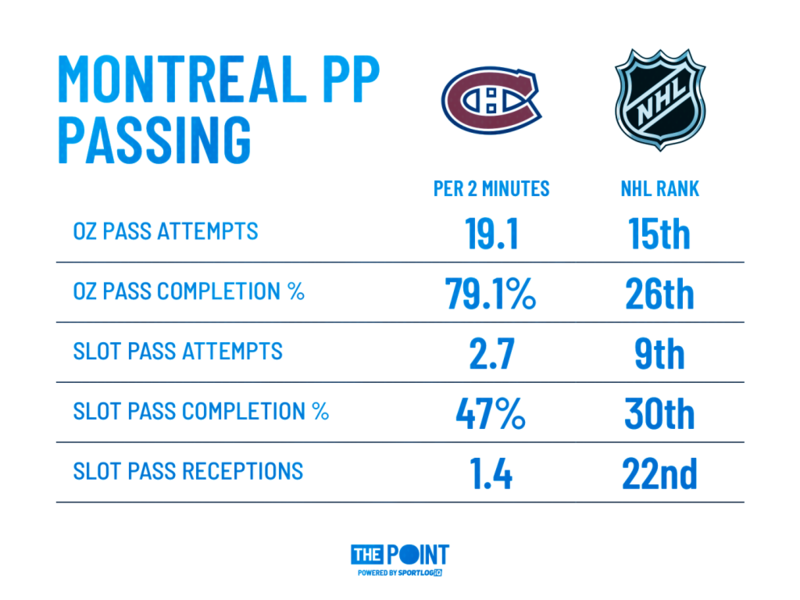 Bad passing leads to bad shot metrics for the Canadiens. Only two teams fail to hit the net on at least half their shots, Montreal and New Jersey. 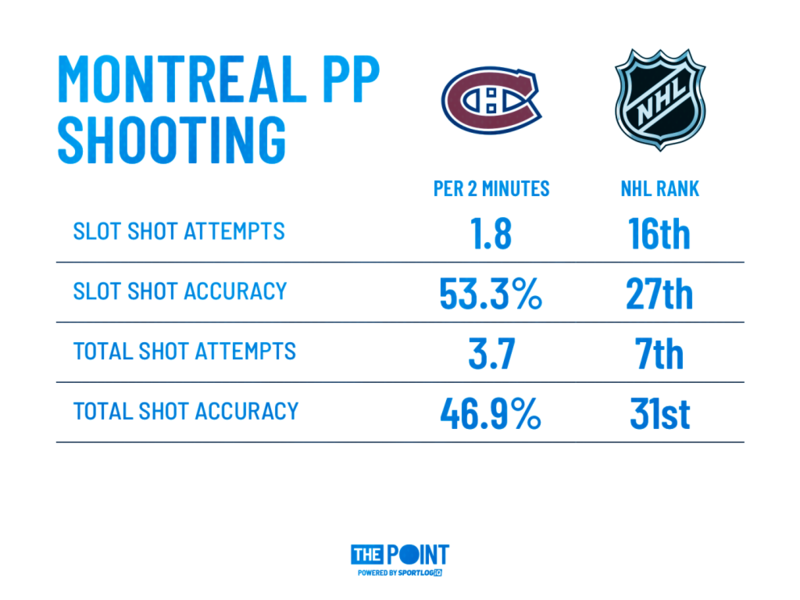 The Canadiens do generate a decent amount of shot attempts and scoring chances, but firing pucks blindly at the net isn’t a good strategy for success. Overall, the Canadiens’ performance on entries over the season is actually very respectable. However, they are dumping the puck in a lot during the current 0-25 stretch, on 26 percent of their entries (25th in that time) compared to 15% before the current slump. Dumping it in this often doesn’t help in limiting the number of puck battles they’re involved in. There is still work that can be done, but this doesn’t appear to be the primary issue with the powerplay, at least when looking at season-long numbers. In the end, Montreal’s powerplay issues come down to a failure to properly use the extra space to generate offense and poor execution. They needlessly get tangled in puck battles and, when they do come out with the puck they whip it around with a “quickness-over-efficiency” mentality. They need to slow it down, move the puck away from defenders and into open space to give their players time to generate some quality chances. It’s not as if the Canadiens have a lack of skill. 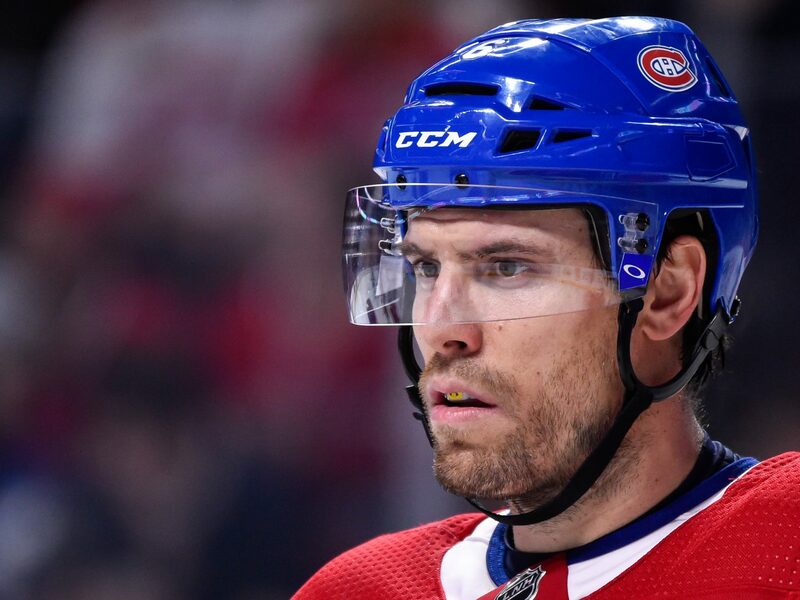 Shea Weber is arguably the most dangerous point shot in the NHL, while Brendan Gallagher, Max Domi and Jonathan Drouin each have skills that, on paper, mesh very well. But the Canadiens need to do more than just try and tee up Weber or have Drouin trying to create something from scratch by himself.